“Why, God? Why?” You cry out to yourself between mouthfuls of gelatinous “fruit” slices (everyone knows Orange is the best) and awkwardly explaining that, while yes, you are the youngest at the table, you forgot how to recite the “The Four Questions” around the time you learned how to puff-puff-pass. The Bob Marley Passover is a new, free, Haggadah from writer (and former Camp Heebaquonk head counselor “Don”) Nathan Phillips and designer Jessica Stewart. And, while there are many (many!) 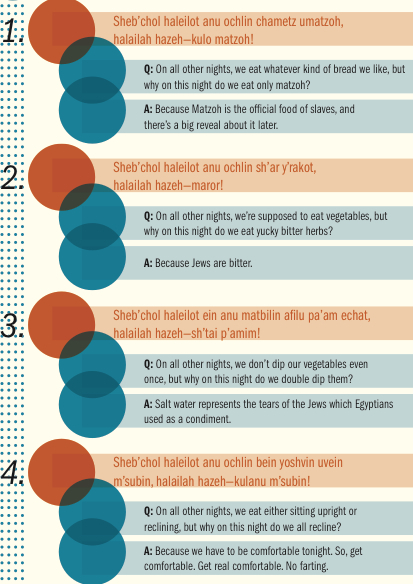 different Haggadah versions out there, this one is hands down our favorite (sorry Maxwell house). From the first blessing (guests are encouraged to name something they love – barring that, they’re asked to name what they hate most about Morrissey) to it’s final song (R. Kelly’s inspirational “I Believe I Can Fly) the Bob Marley Passover (which, come to think of it, doesn’t really have much Bob Marley in it) succeeds in capturing the spirit of the holiday, if not always the letter. Fine by me. Hell, better than fine. The Bob Marley Passover is genuinely funny, which puts it head and shoulders above 99.9% of the treacly crap people foist on unsuspecting seder guest to try to fool them into thinking they’ve actually enjoying themselves. There’s even a “family version” for those looking to downgrade from a soft-R to a hard-PG-13. Seders, and Passover at large, can be long, laborious ordeals that end up embodying that old joke about airline food: It’s awful, and there’s never enough of it. Thankfully, the Bob Marley Passover is a breath of fresh air (among other inhale-able substances). I checked it out, and I think it had so much more potential than what the authors did.